When God created humans, he designed us to live in families. Family relationships, therefore, are important to God. Even the church, the universal body of believers, is called the family of God. When we receive God's Spirit at salvation, we are adopted into his family. This collection of Bible verses about family will help you focus on the various relational aspects of a godly family unit. 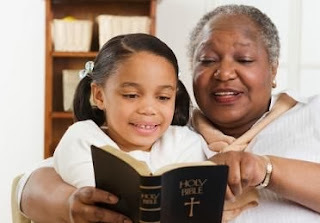 Read verses that give the biblical perspective on subjects relating to families, such as love, family relationships, family problems, family values, children, strength, and death. Read verses from the Holy Bible about family in relation to God, Jesus Christ, and the Christian faith. Children, obey your parents in the Lord, for this is right. “Honor your father and mother”–which is the first commandment with a promise. She gets up while it is still dark; she provides food for her family and portions for her servant girls. She considers a field and buys it; out of her earnings she plants a vineyard. She sets about her work vigorously; her arms are strong for her tasks. Children are a gift from the Lord; they are a reward from him. Children born to a young man are like arrows in a warrior's hands. How joyful is the man whose quiver is full of them! He will not be put to shame when he confronts his accusers at the city gates. The wicked die and disappear, but the family of the godly stands firm. Jesus called them over and responded with an illustration. "How can Satan cast out Satan?" he asked. "A kingdom divided by civil war will collapse. Similarly, a family splintered by feuding will fall apart." They are the people of Israel, chosen to be God's adopted children. God revealed his glory to them. He made covenants with them and gave them his law. He gave them the privilege of worshiping him and receiving his wonderful promises. So now you Gentiles are no longer strangers and foreigners. You are citizens along with all of God's holy people. You are members of God's family. Children, always obey your parents, for this pleases the Lord. So an elder must be a man whose life is above reproach. He must be faithful to his wife. He must exercise self-control, live wisely, and have a good reputation. He must enjoy having guests in his home, and he must be able to teach. He must not be a heavy drinker or be violent. He must be gentle, not quarrelsome, and not love money. He must manage his own family well, having children who respect and obey him. For if a man cannot manage his own household, how can he take care of God's church?